Begin an epic journey in the rugged tracks of the most unlikely heroes. Enter the world of the Harvesters where badgers, rabbits, squirrels, and otters launch into adventures of epic wonder. Here the smallest of creatures take on the roles of the greatest heroes: knights, Druids, Clerics, Rogues, Wizards, and Fighters. Together they tackle the greatest of adventures, from rescuing the princess to finding a lost treasure. Harvesters is a game for the child in all of us! 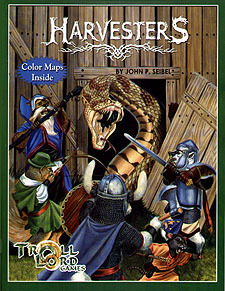 Harvesters is a role playing game designed for play by the whole family. Using the wildly popular and easy to use Castles & Crusades Siege Engine, players choose any one of the listed animals to play, in any of the classes provided, and with them begin a long journey of adventure. Designed for children ages 6 and up, Harvesters is the perfect game to bring everyone together. Children delight in taking on the roles of their favourite animals and parents find the role of Castle Keeper easy and fun! Harvesters provides all the rules, equipment, and spells you'll need to get started playing any number of animals. Also included is an adventure setting where all the adventures come to life. Wheat Hollow comes complete with maps and back ground. Harvesters includes a starting adventure as well. The adventure begins in the sleepy little town of Wheat Hollow where magic and mischief are always afoot. Old Farmer Thistledown's farm has been burgled by some beast and whatever it is haunts the environs of Wheat Hollow. Plunge into the wilderness to face down the villains who alone are bringing terror to the goodly creatures of Wheat Hollow.